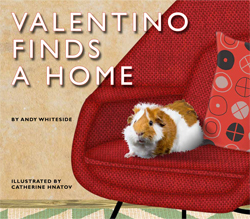 Valentino is an adorable guinea pig who decides to run away from where he was born in Bolivia because there he could be eaten. After a long strip as a stowaway he finds himself still discriminated against as people think he is a rat and treat him accordingly. His search for a safe home has many obstacles but eventually finds a home and a friend. The mixed media collage accentuates the difference between the adorable and realistic Valentino and his surroundings and the people and other animals that feature in the story, as they seem to be digitally drawn. As on the cover, many of the backgrounds exhibit interesting textures. I had hoped to use this book for the Reading the World Challenge, but other than the first page talking about the fact that guinea pigs eaten in Bolivia there was nothing more about South America so I don't think it was appropriate for this challenge. My kids found it interesting that they eat guinea pigs but they weren't shocked or anything. They've eaten rabbit (most Japanese are disgusted by this!) and raw horse (which I am a little skeeved by!) We did have a nice talk about what people eat around the world and how it is only recently that Japanese people ate pork and beef. That necessitated a conversation about whale and how I will make them a packed lunch if it shows up on their school lunch menu! This sounds like a great book to share with my 2nd graders. I will put it on my library list. Thanks for sharing. Thanks for visiting Cheryl, I think the writing would be great for second graders to read.